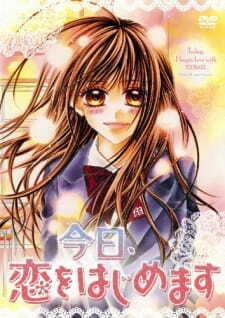 Hibino Tsubaki is a shy, kind, and slightly old-fashioned girl who has always been the top student in her class. She always did everything her parents wanted her to do. She loved to do other girls' hair in trendy and cute styles, despite always wearing plain braids herself. I see a lot of people raging about this series on the forums and the review section, so I'm here to give you my two cents. Kyou, Koi wo Hajimemasu is a difficult OVA to recommend. For newcomers who have never read the manga will find the first episode (and probably the rest of the OVA) to be confusing. Why, you ask? Because the first episode starts at the first major climax of the manga. Which I believe in the manga starts at chapter 15, so all anime viewers would be missing 14 chapters of background content of the first episode. If you do want to watch the OVA be prepared to be completely mind blanked at some scenes. But this is the true nature of the OVA of Kyou, Koi. The OVA is suppose to cater to the manga readers and draw the anime watchers to read the manga. Which effectively worked for me again. (Since I dropped the manga and plan on reading it again for the second episode of the OVA.) How do I know this? Because the OVA was bundled with the ninth volume of the manga in Japan. So it was not set to sell to the mainstream audience, but only to the manga followers who continue to read and support the manga. J.C. Staff is at the helm of animating Kyou, Koi. (J.C. Staff is also animating another shoujo alongside Kyou, Koi called Kaichou wa Maid-sama. But Kaichou wa Maid-sama gets a whole TV series to go through the manga.) The art is decent and stays true to the manga, which was a good thing. Obviously, J.C. Staff did not plan on having a big budget to animate this OVA, because it was just going to be an extra bundle to a manga volume. But I was surprised at the background art, which were drawn very well considering the small budget they had to use. Soundtrack and voice acting wise, I thought were pretty good. Lots of piano/orchestra music fitting the shoujo setting of the anime. And Itou Kanae voices the main female lead in the OVA. Who is also know for doing Himamori Amu in Shugo Chara. Coming right from another shoujo is Namikawa Daisuke, who is fresh off the shoujo scene from voicing Kazehaya from Kimi ni Todoke. He voices the main male lead, but instead of playing a cheerful character like in Kimi ni Todoke, voices a rough serious character instead in Kyou, Koi. Overall, I did enjoy this OVA, since it was literally a copy and paste of the manga. Except with added color, voice acting, animations, and background music. But again what makes this OVA so hard to recommend is because it was specifically made for the manga readers and will be a total loss for the anime only watchers. So here's to me hoping that J.C. Staff will do a full adaptation of the manga if they find out the OVA did well. But I'm not keeping my fingers crossed, since it seems to be such a small chance. *Second episode of the OVA comes out bundled with the tenth volume of the manga, so expect that to not follow the time line of the first episode of the OVA. Kyou, Koi wo Hajimemasu is a very short romantic story about two young high school students sharing the same name. After a terrible first meeting, the girl fell in love with the guy sometime later but was rejected by him. What follows is a story on how the two eventually becomes closer to each other. The story is quite simple and cliche, but being a short 2 episode long, the OVA manage to flesh out enough story details to make the story convincing and watchable at least. The main highlights of these OVA are the still animation scenes which are rather breathtaking, artistic and beautifully rendered but this are quite few. The same thing cannot be said on the animation with movements though as it lacks fluidity, the environment is somewhat bland and poor in details. The character designs are passable and likeable as it features narrow faces, pointy chins and hair lines that are too many which clearly indicates that this is a shoujo anime. In general, the production values are quite low. The OVA is kind enough to provide an Ending theme song which is quite good to listen and a couple of well orchestrated soundtracks which fits fairly well for overall mood of the story. In the character side of things, nothing much is revealed other than the fact that main characters are of good standing being honor students. Voice acting is fairly well done as it features well known voice actors such as Itou Kanae as the female lead Hibino Tsubaki, and Namikawa Daisuke as the male lead Tsubaki Kyouta. Overall, my impression of this short OVA is quite positive since I have a natural inclination on romance stories that are fun to watch and not overly dramatic. "Kyou, Koi wo Hajimemasu" is quite difficult to recommend to other viewers because after a quick look around the origin of this OVA, I found out that this is actually just a bonus item for a shoujo manga bearing the same title so its target audience are the manga readers who have a good understanding of the overall story. So if the viewer is a manga reader then this is a highly recommended OVA, but for other viewers like me who haven't read the manga or have no intention of reading the manga, it is still watchable, just don't expect great things. Please note, i have not read the manga, so i shall be writing my review based on the anime i have seen. I have never been more frustrated at an anime in such a away- this had so much potential to become something more, yet it lacked that extra bit more. One of its major flaws was rushing into the 'major climax' of the story between the 2 main characters, Tsubaki & Kyouta. With no explanation or plot development, BANG, it's almost like the ending started before the beginning. To be fair there was a short narrative beginning, but it would have been great to watch it develop, to see how it got to this point. The sound i thought fitted in very well with the anime & i thought the seiyuu performances were very good.The anime wasn't bad but it was really those still-shots that really stood out- beautifully made. The second OVA doesn't follow the OVA, and so they are best treated as 2 separate OVAs, so it lacks some continuity and flow. I feel like they could have done a whole season's worth instead of trying to cram so much, yet deliver so little into 2 20 minute OVAs. Ultimately i did like this anime, there was something charming about it that sucked me in. If only there was more substance and development to make more than just some romance.